Does anyone but me bristle when you’re watching TV and some stations or advertisers have to call the Superbowl “the big game”? I hate that! And apparently they have to call it that because just saying the word “Superbowl” is a licensing infringement. You’ll know what happened if this post suddenly disappears. 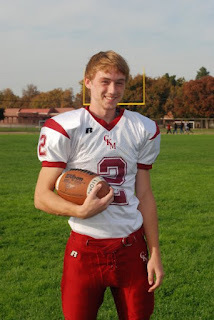 To be truthful, I don’t even like football. In fact, I hate it. It is so boring. Except when this kid is playing. Then I like it. But that was 2 years ago and I’m back to not liking football. And let me apologize in advance for the poor quality of some of these pictures. It was dark and gloomy and there was no good light. It’s winter, I can’t control the light. My ingredients are doubled here, because I made a lot of this stuff. People love it. I also forgot to put the onion and blue cheese in this picture. 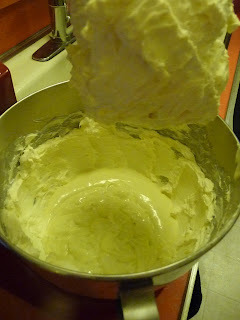 With a mixer, beat the room-temperature cream cheese until it’s light and fluffy. Add in the blue cheese dressing and mix through. 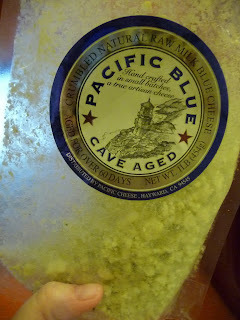 Add a cup of blue cheese, crumbled. 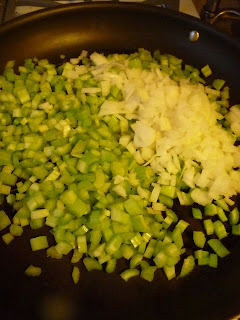 Saute the celery and onion until al dente. Season them with salt and pepper. 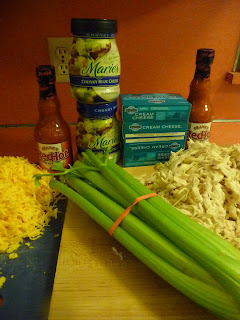 In a big bowl, combine the shredded chicken, the blue cheese mixture and the onion. Next add in an entire bottle of Frank’s Red Hot sauce. A 12-oz bottle. Mix it all together. 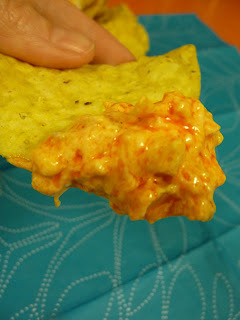 It’s really orange, and it doesn’t look very appetizing. 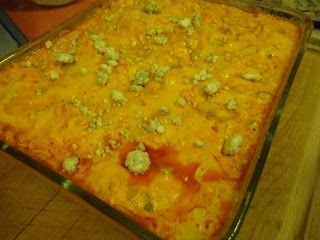 Spoon the dip into oven-proof baking dishes at bake in a medium oven for 15-20 minutes, just until heated through. 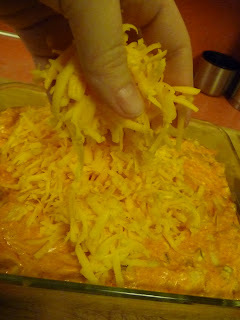 Add in 8 oz of shredded cheese and stir it through. I know, it looks totally disgusting, but bear with me here. It actually tastes really good. Top a tiny bit of the shredded cheddar and some blue cheese. At this point, you can put it back in the oven and bake it again until the cheese melts, or let it cool, cover, and refrigerate until it’s game day. Just make sure you bring it to room temperature before you bake it again. 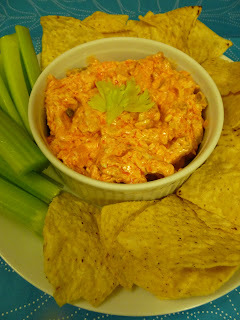 You can serve it in the giant baking dish or serve it in smaller receptacles. I garnished it with celery leaves. 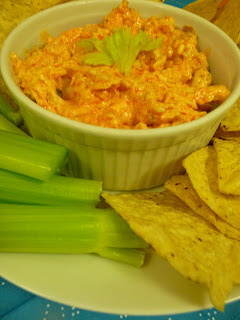 This is equally good with crusty French bread, tortilla chips, or crudite. Go team! 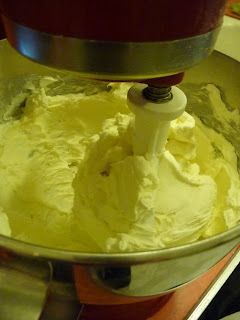 Using a mixer, beat the cream cheese until light and fluffy. 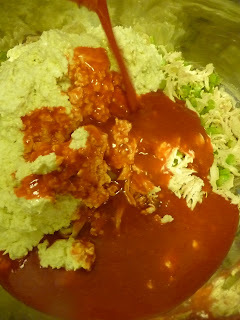 Add in the blue cheese dressing and mix through. 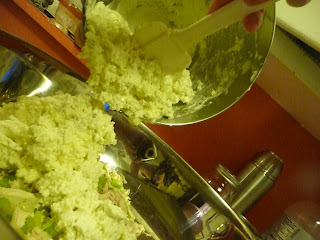 Add in the crumbled blue cheese. 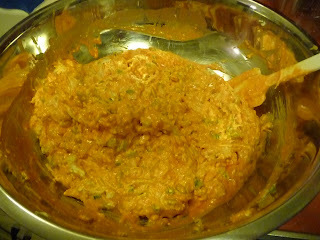 Transfer to a large mixing bowl, add the shredded chicken and set aside. Melt the butter and saute the celery and onion until softened. Season the vegetables with salt and pepper. 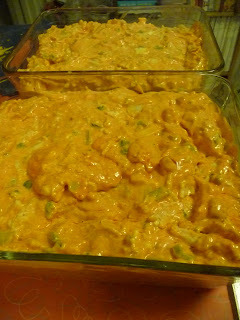 When they are cooked, add to the bowl with chicken and cheese mixture. Fold in the Frank's Red Hot sauce. 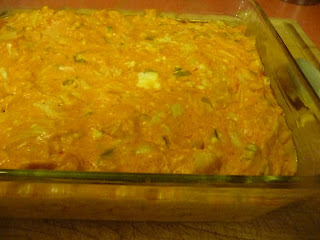 Pour mixture into an oven-proof baking dish, and bake for 20 minutes. After 20 minutes, or when the mixture is heated through, remove from oven and stir through the cheddar cheese, saving a little to put on top. Sprinkle a little more blue cheese on top, too, if you want. Put it back in the oven for another 10-15 minutes so that it just melts the cheese. 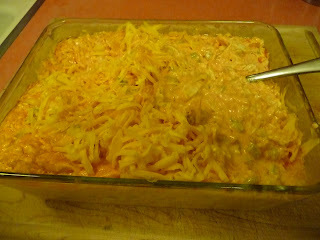 Serve it in the baking dish if you want, or spoon into smaller dishes. Accompany it with crusty French bread, tortilla chips, celery, carrots, Melba toast, spoons, whatever.